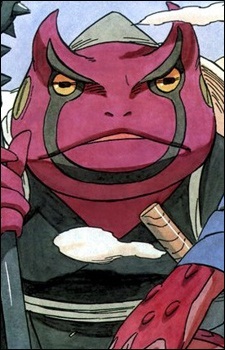 Gamaken (ガマケン; Literally meaning "Strong Toad") is a giant toad that first appeared in Part II. He wields a Sasumata-like weapon and a shield. He seemed to be a skilled fighter whilst fighting alongside Naruto. He also seems to be wearing the same robe as Gamabunta. 20 Facts You May Not Know About Naruto! Everyone knows the series Naruto by Masashi Kishimoto, but do you know all of these little facts and tidbits about both the anime and manga? Buckle up and get ready for some good old trivia!